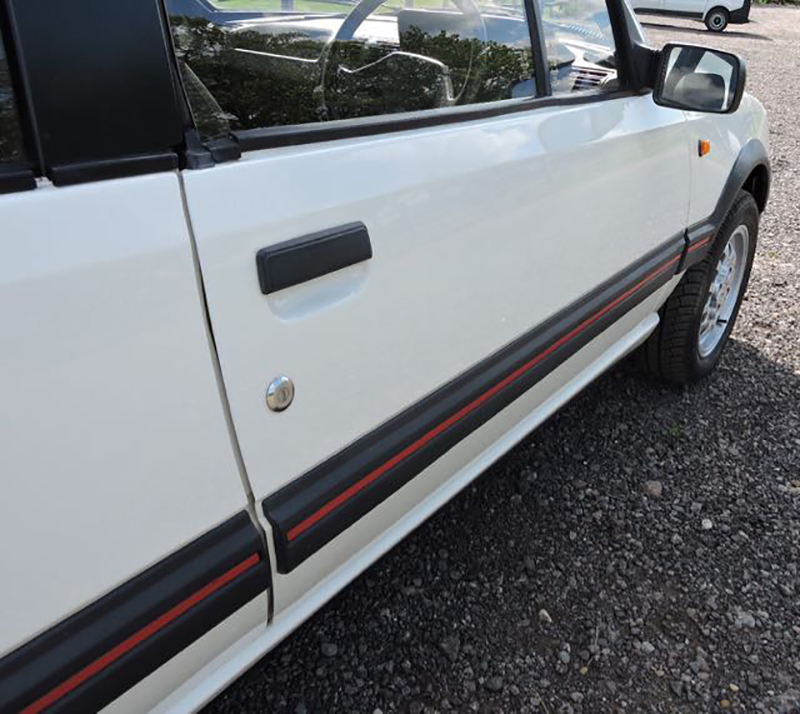 With a very low mileage of just over 67000 miles and 2 owners we believe the mileage to be genuine. 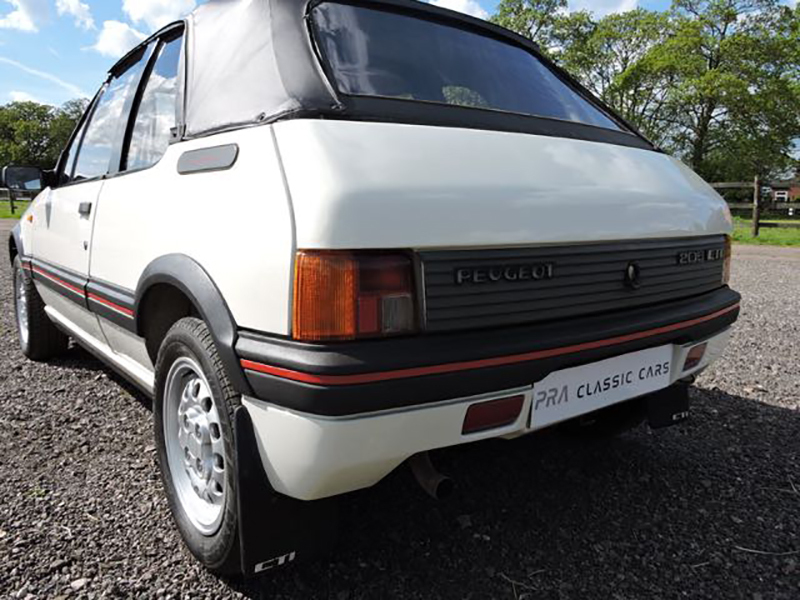 The car presents in beautiful condition giving the impression she has been restored at some point but which in fact is just a well loved and original example. 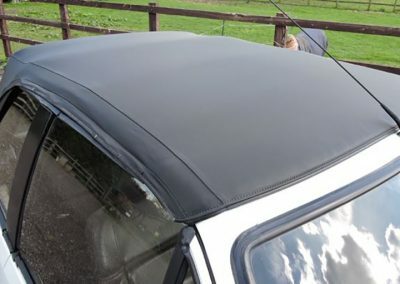 The car has been stored for the past ten years and only covered 3000 miles in the past 13 years. 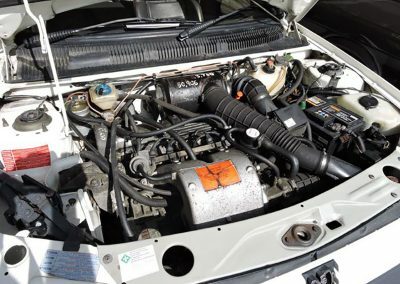 The car has a limited service history but had the all important cam belt changed just 100 miles ago. 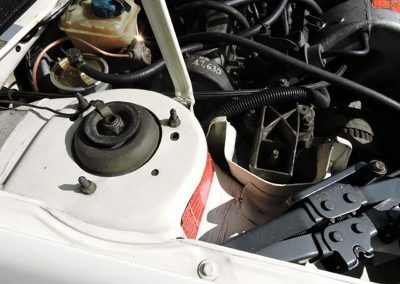 The car also had a brake/steering and suspension overhaul in July 17 and a service in October 17. 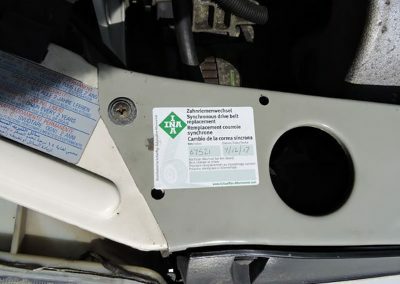 As previously mentioned the car has only covered 3000 miles in the past 13 years. 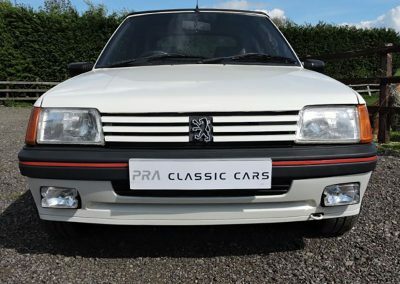 The Peugeot will come with a fresh 12 month MOT prior to sale. 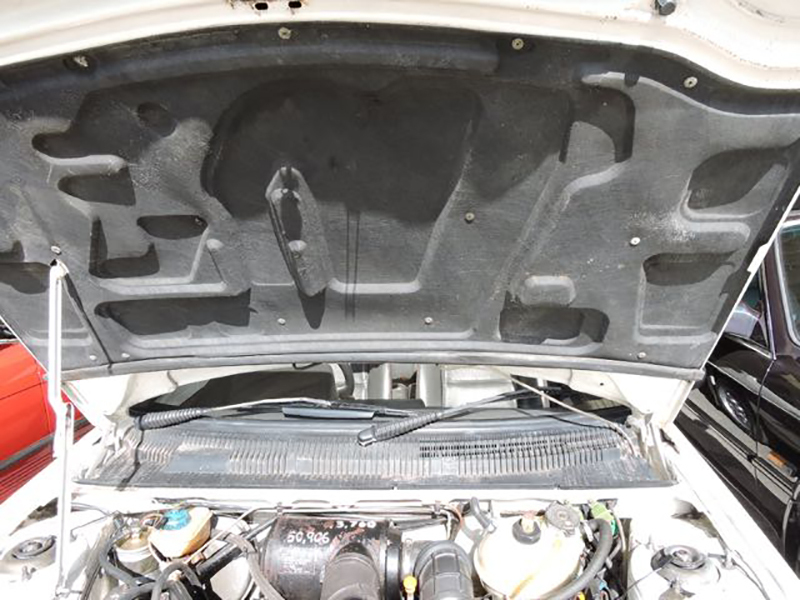 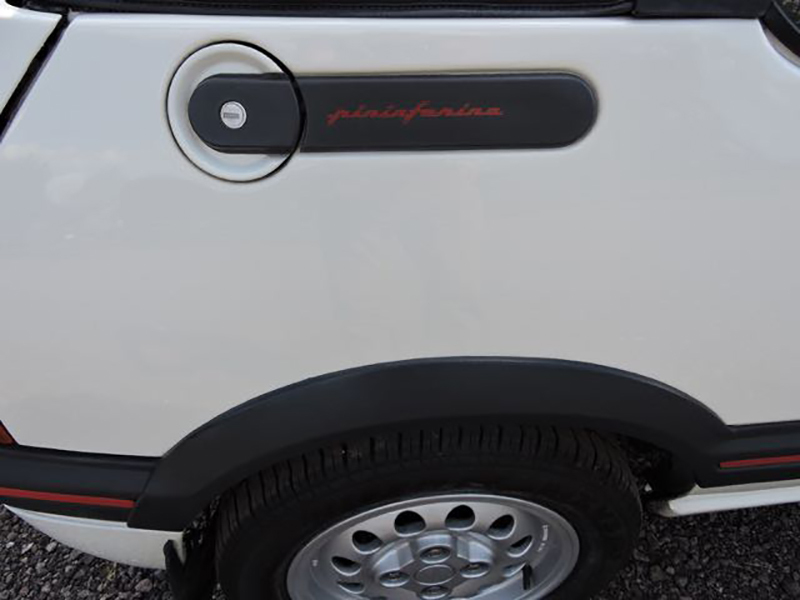 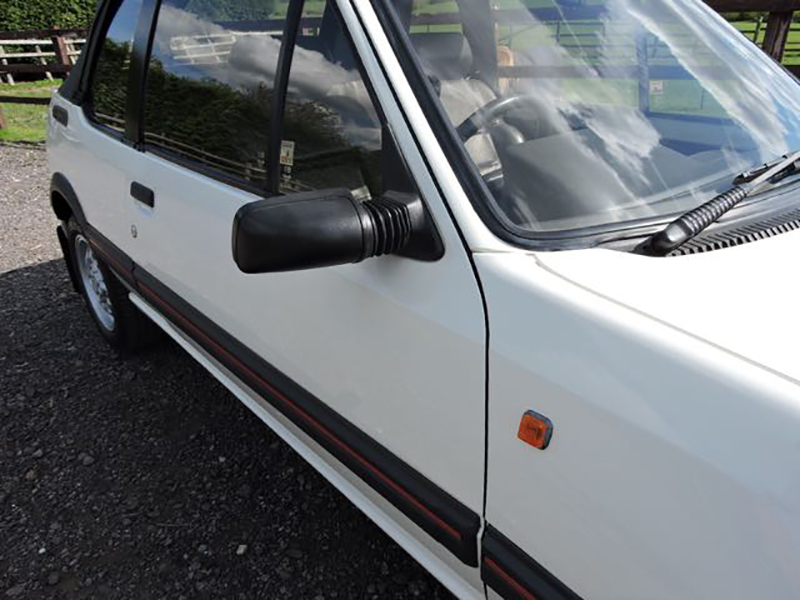 The white paintwork is in exceptional condition for the age of car with very few stone chips or marks and no visible corrosion. 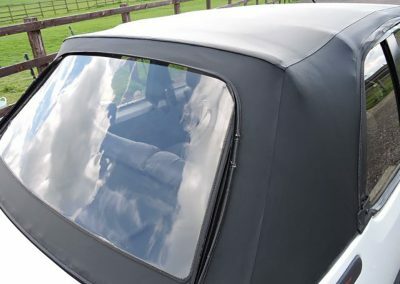 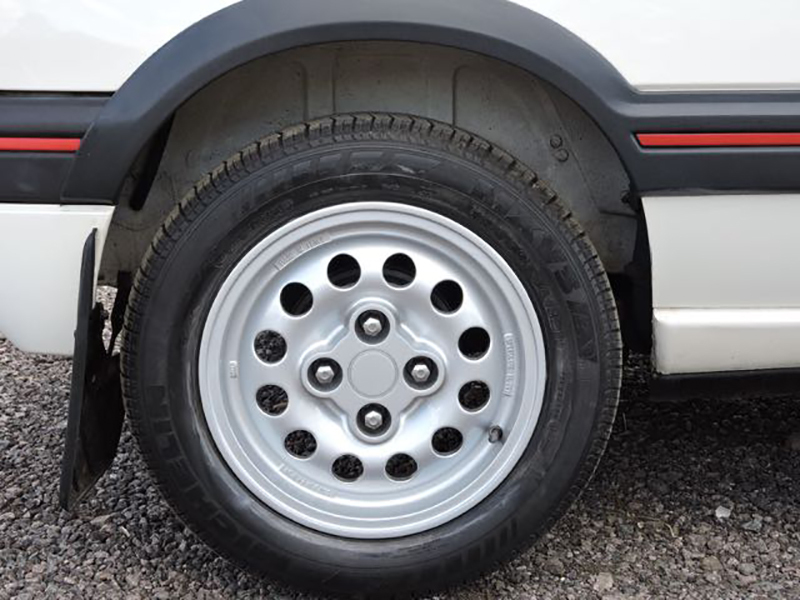 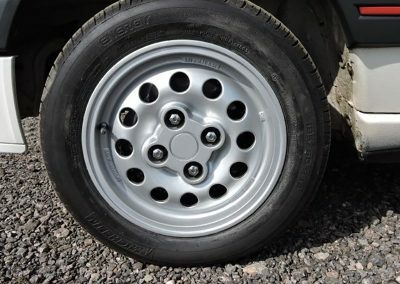 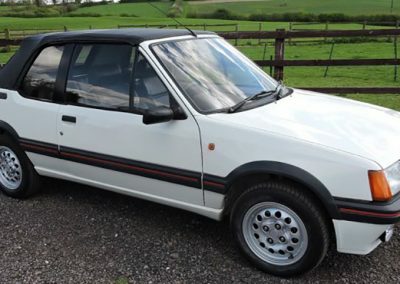 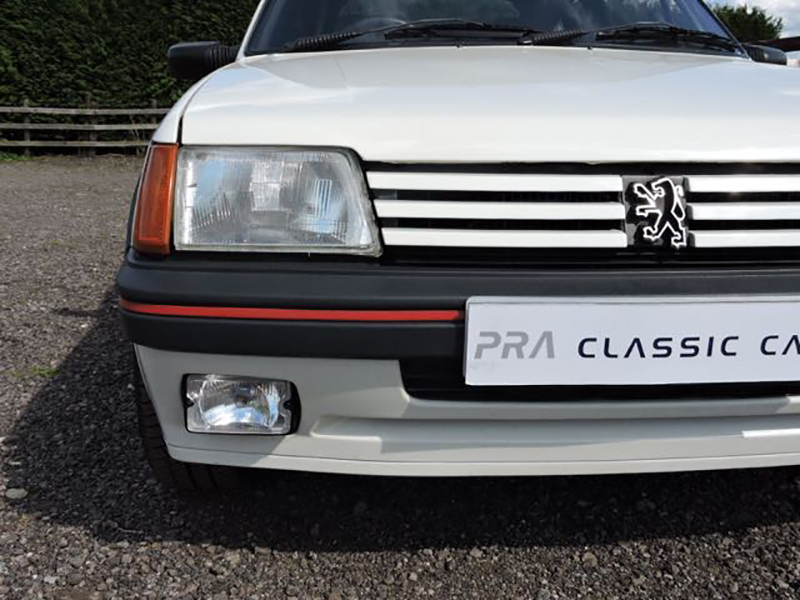 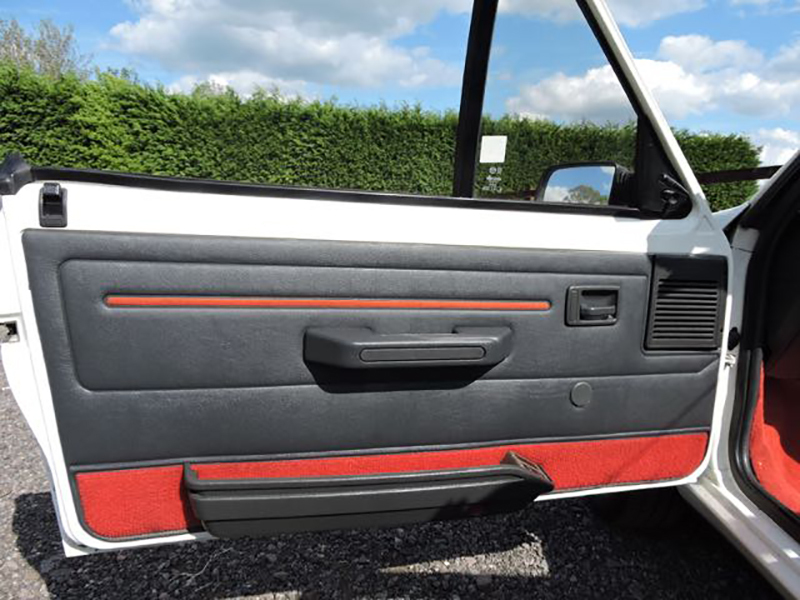 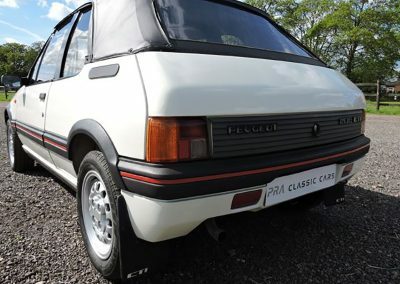 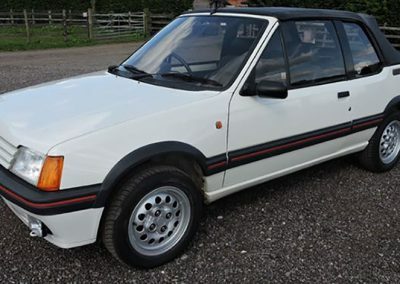 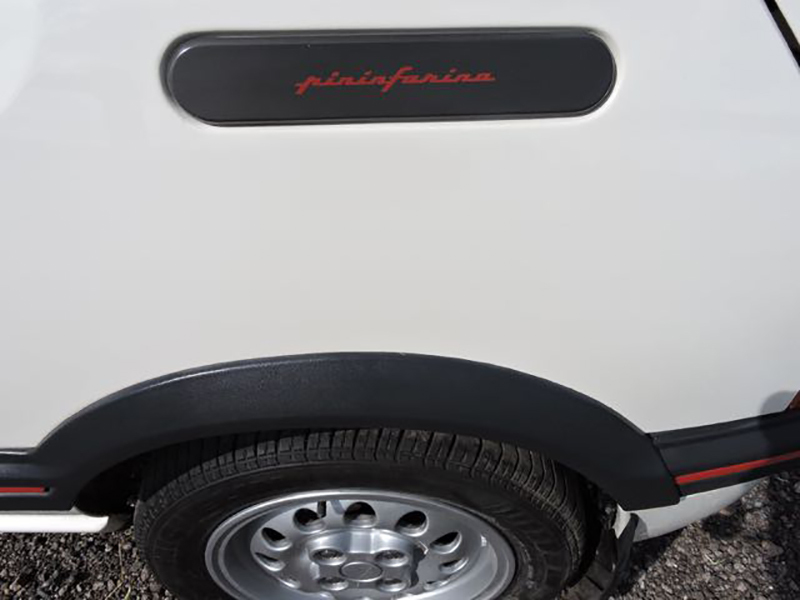 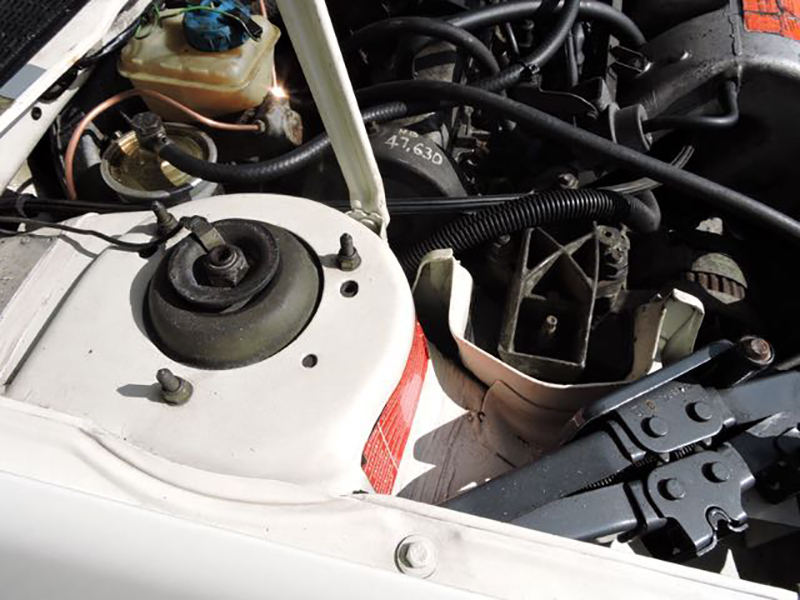 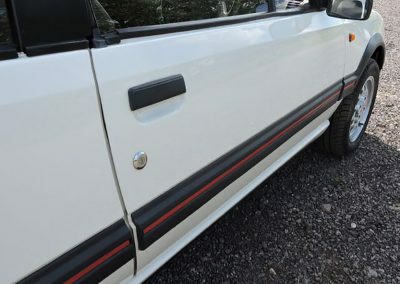 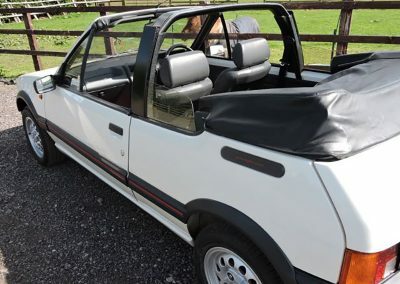 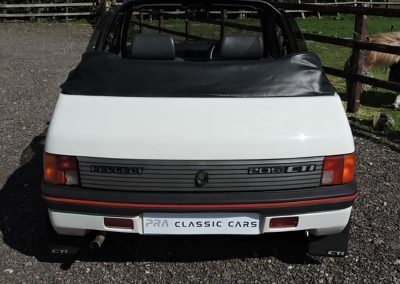 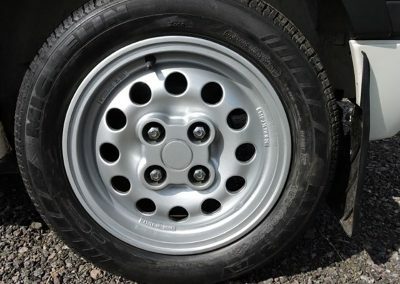 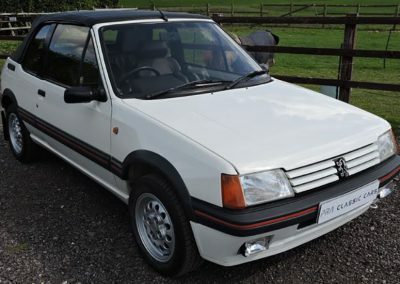 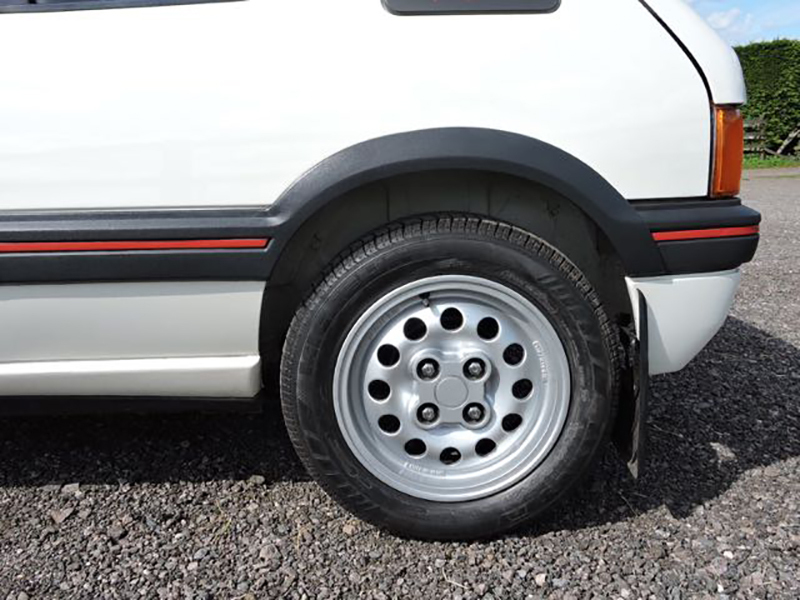 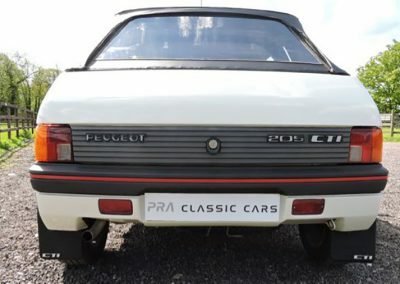 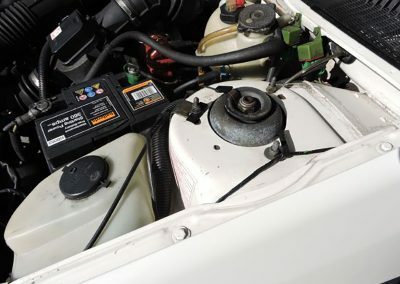 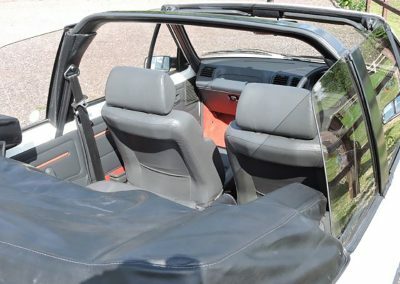 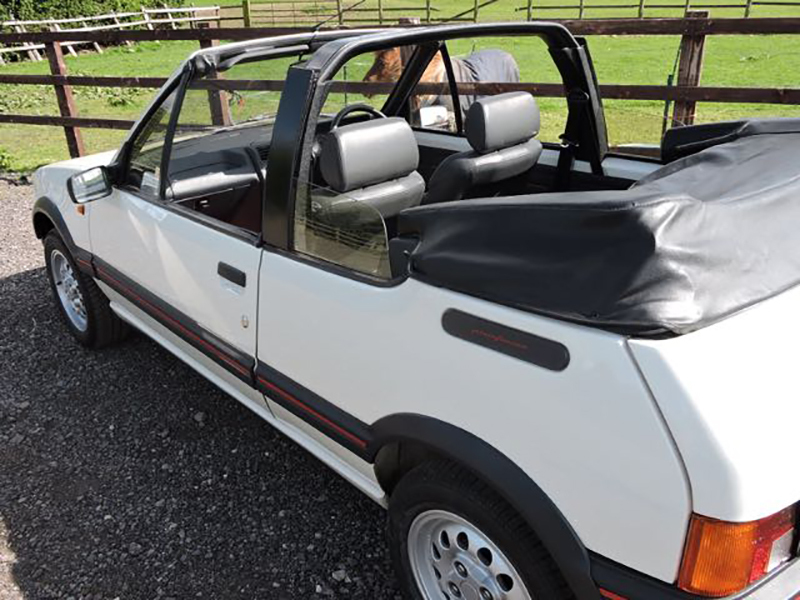 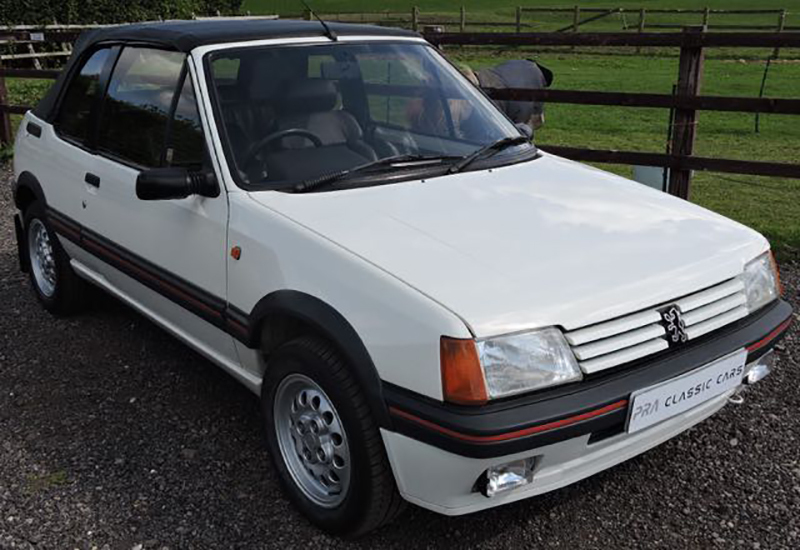 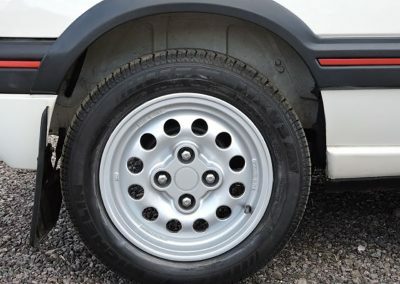 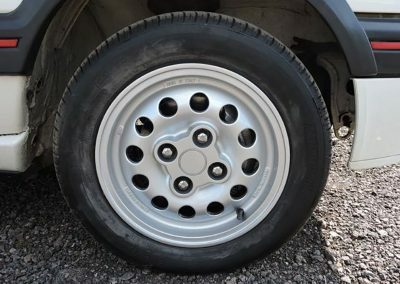 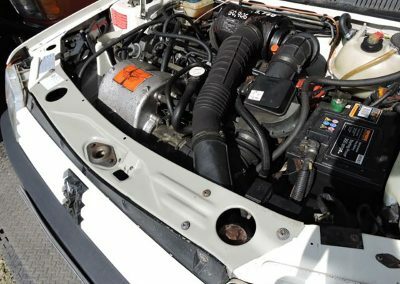 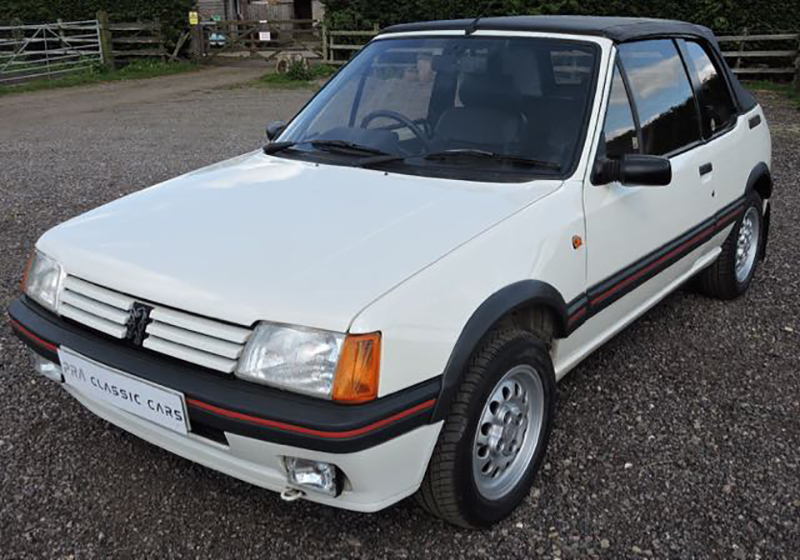 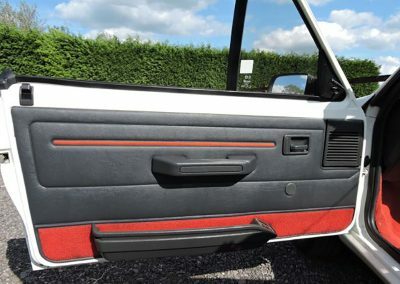 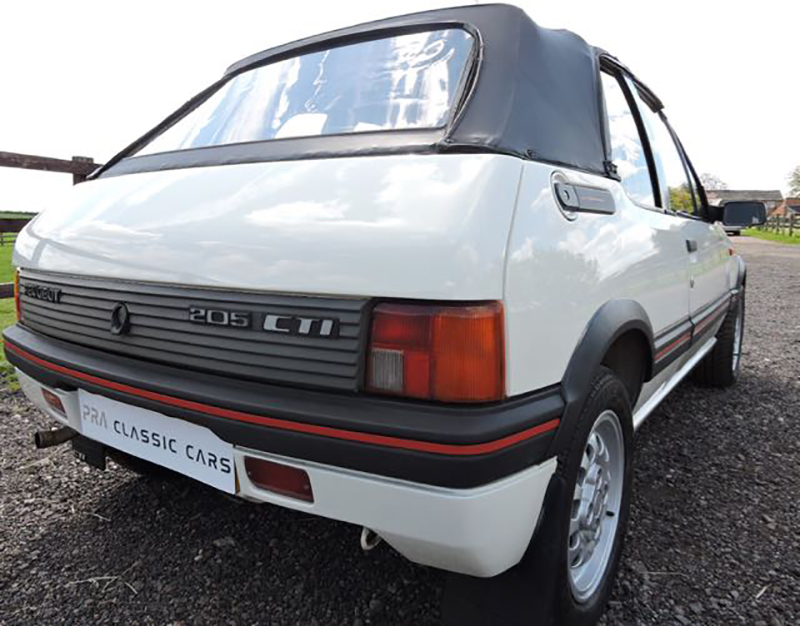 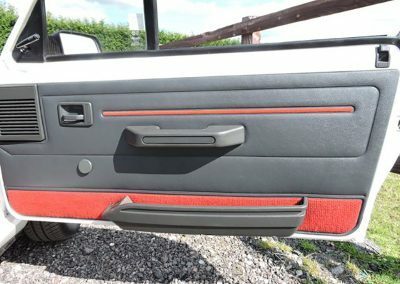 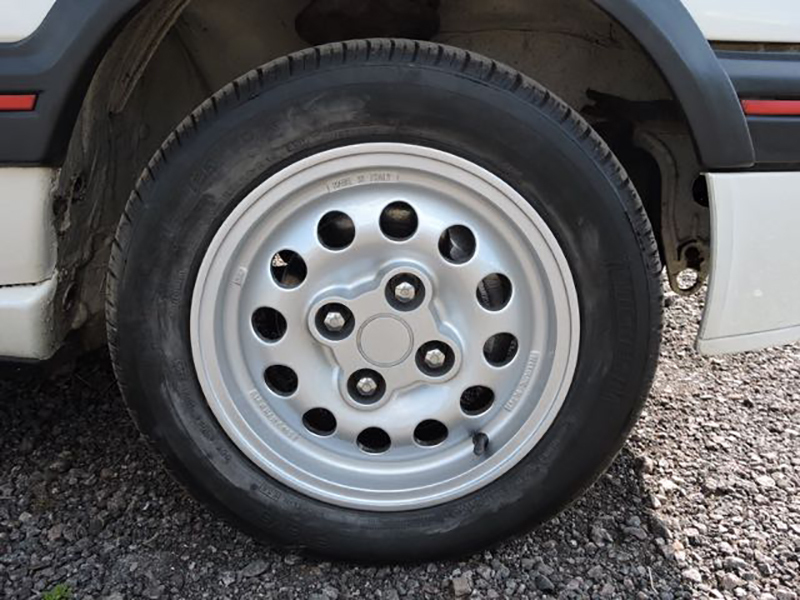 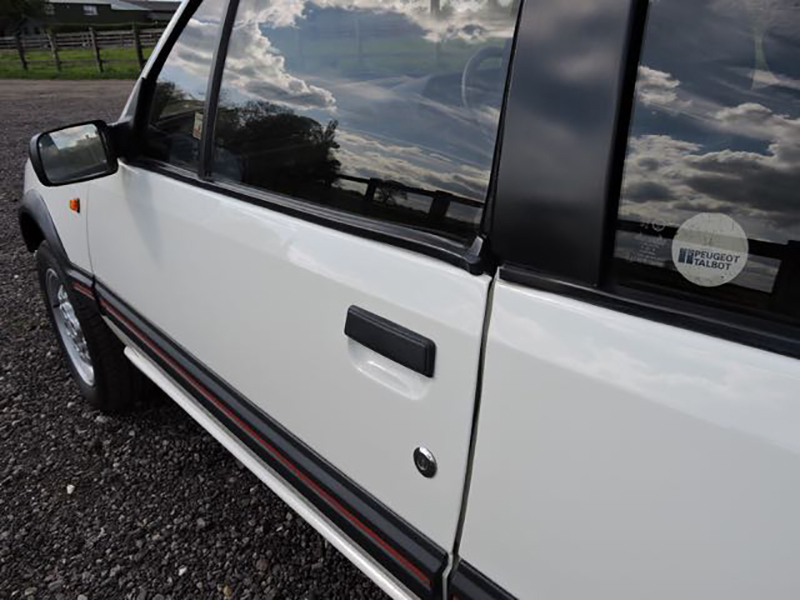 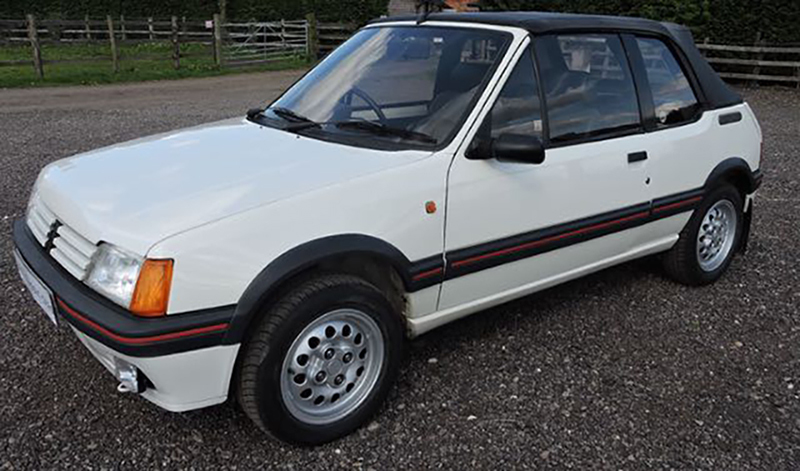 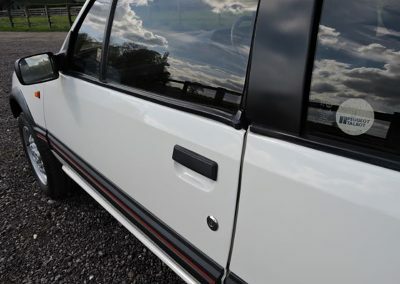 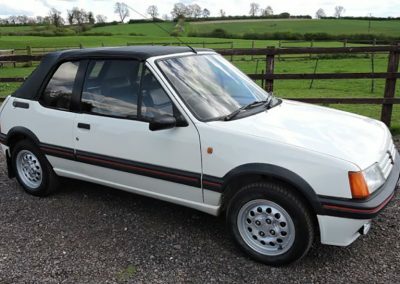 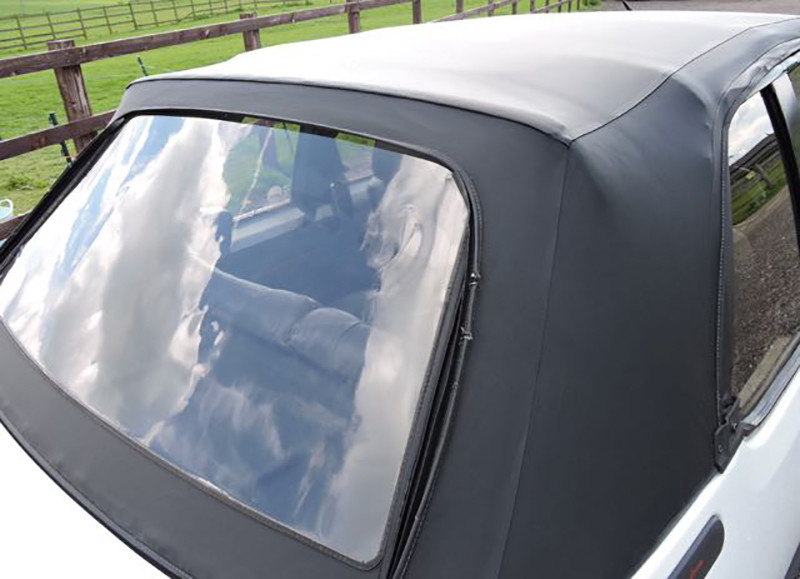 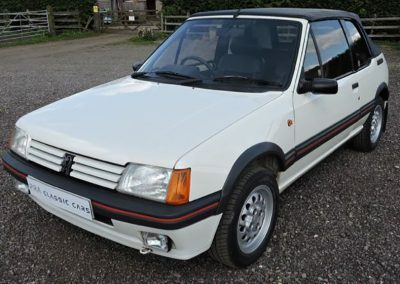 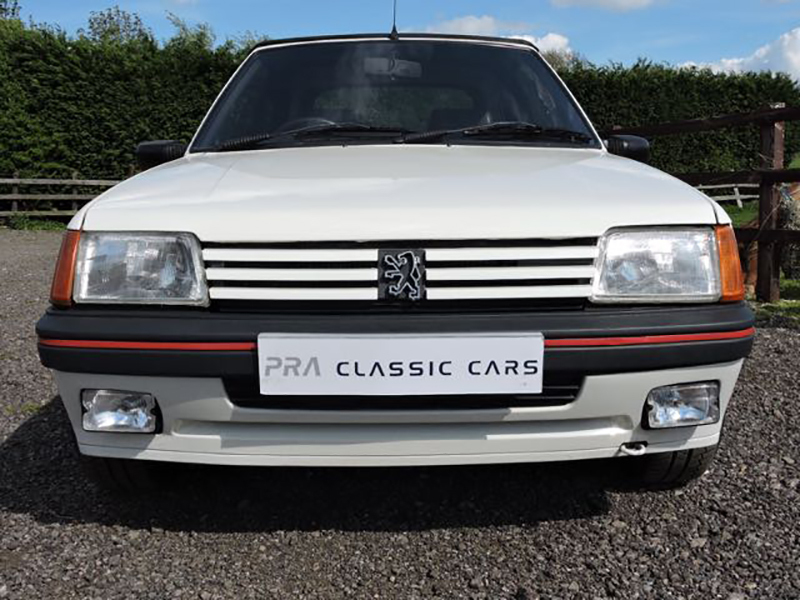 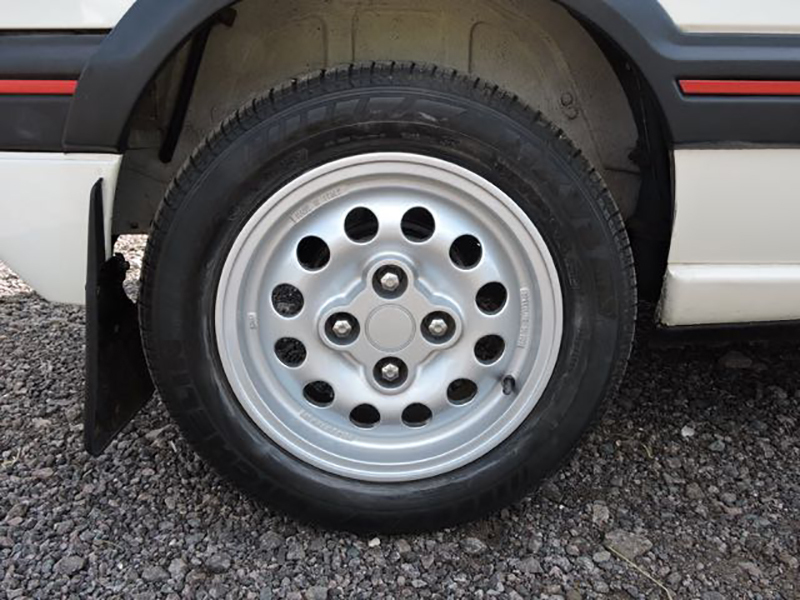 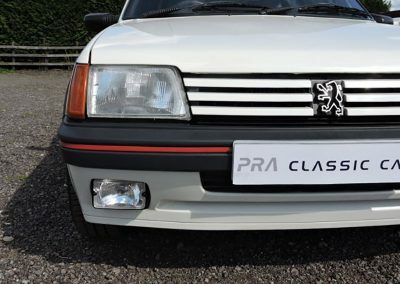 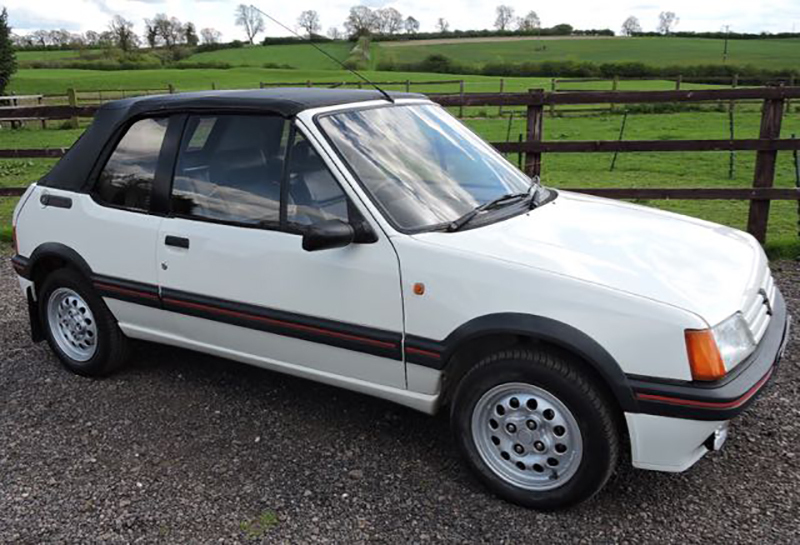 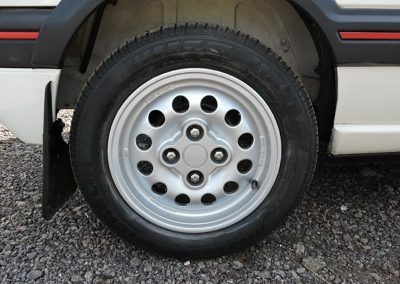 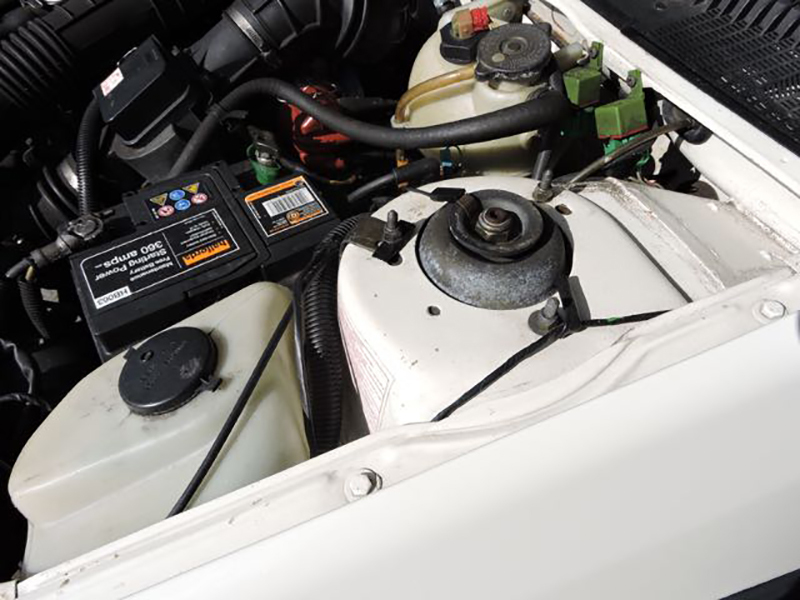 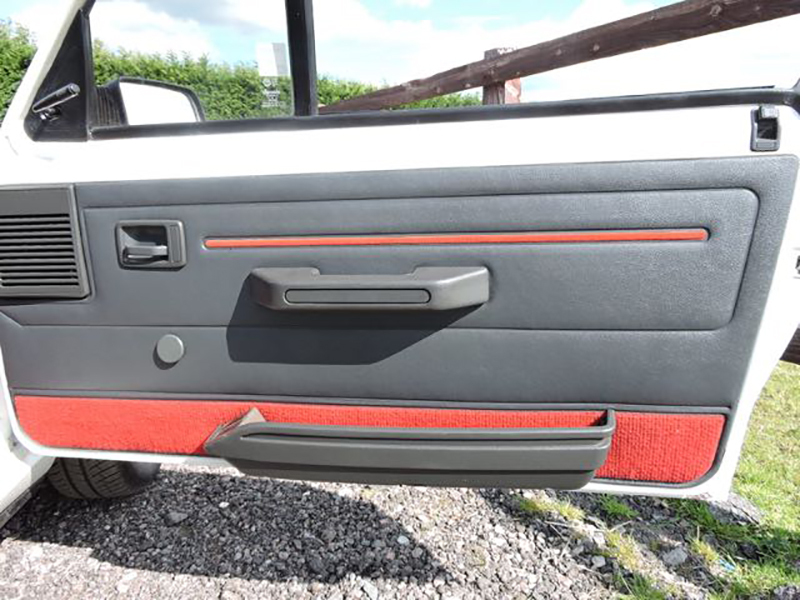 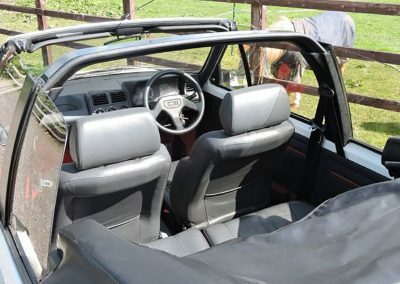 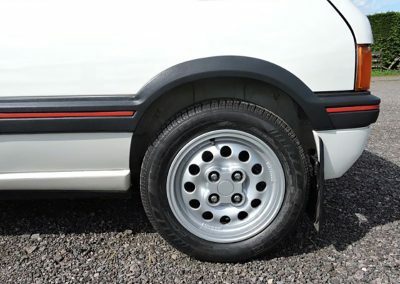 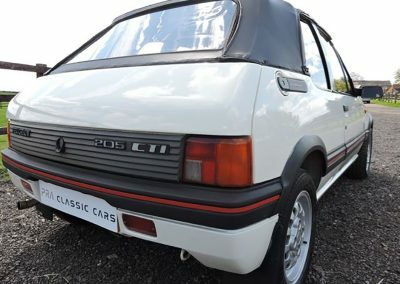 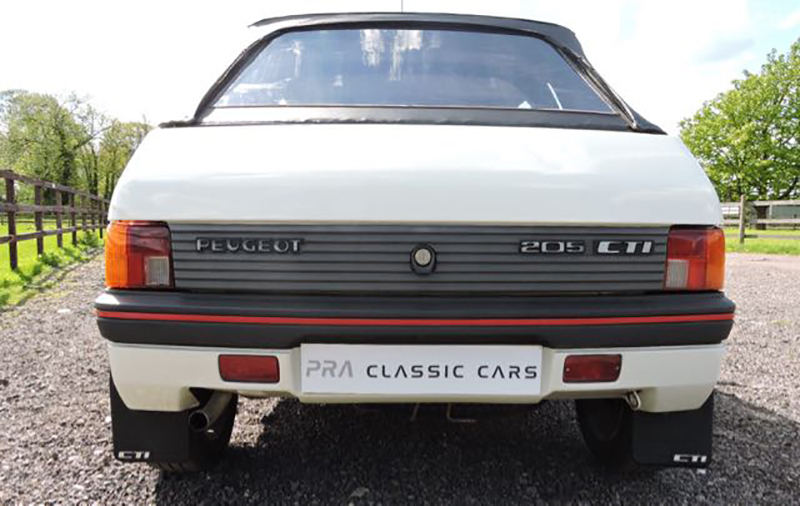 The body mouldings so often look shabby on Peugeot 205s are free of marks and the alloy wheels are gleaming having been refurbished and shod with Michelin tyres with plenty of tread left. 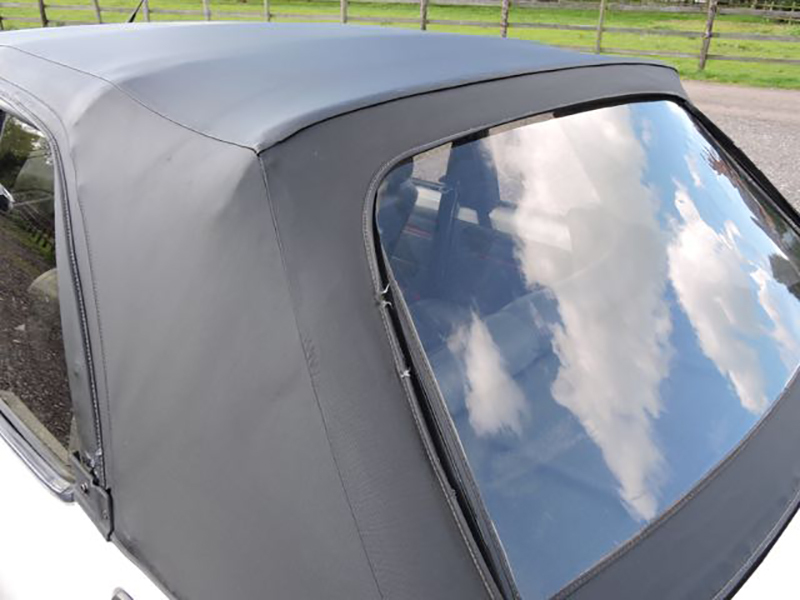 The black folding hood is in very good condition and is manual in operation with a clear rear screen. 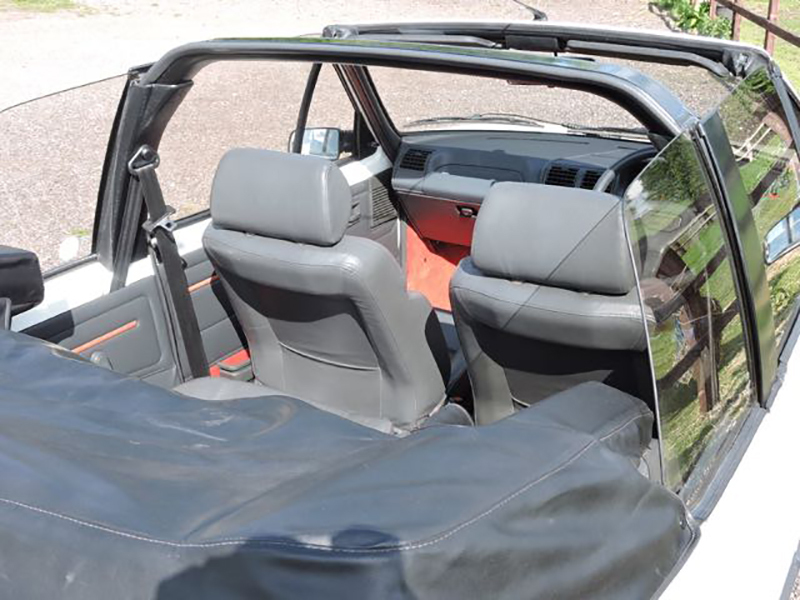 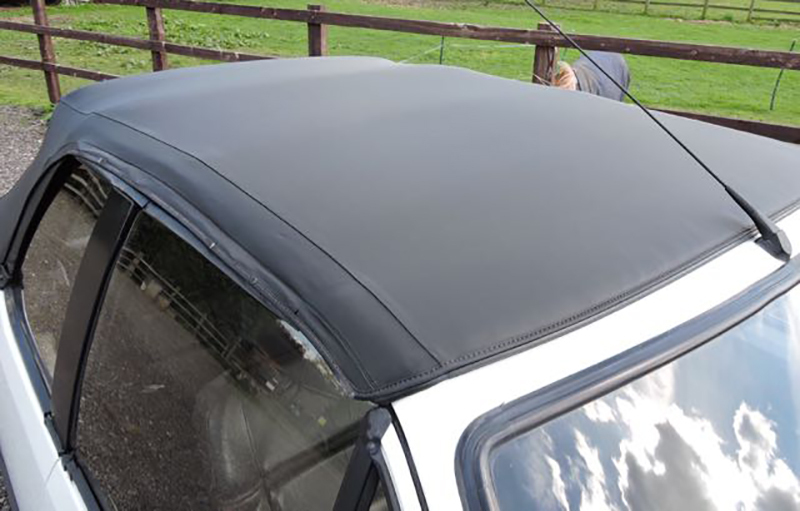 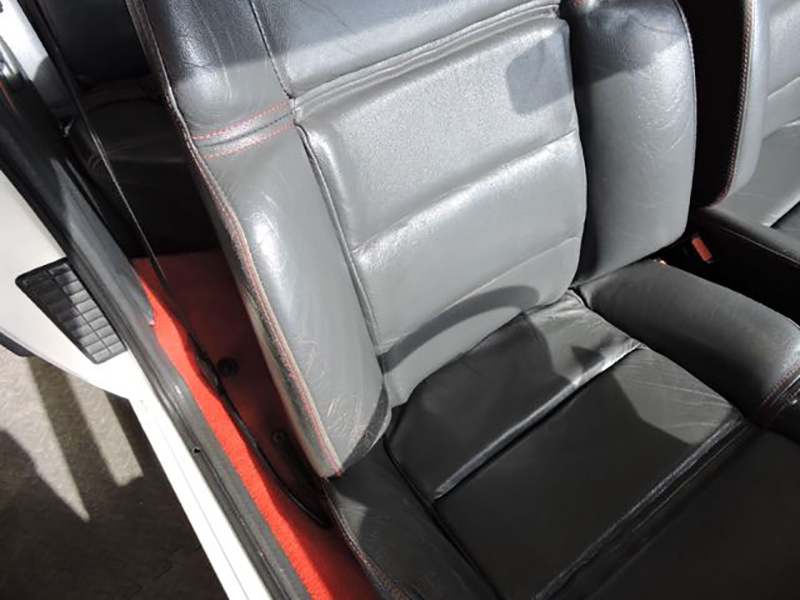 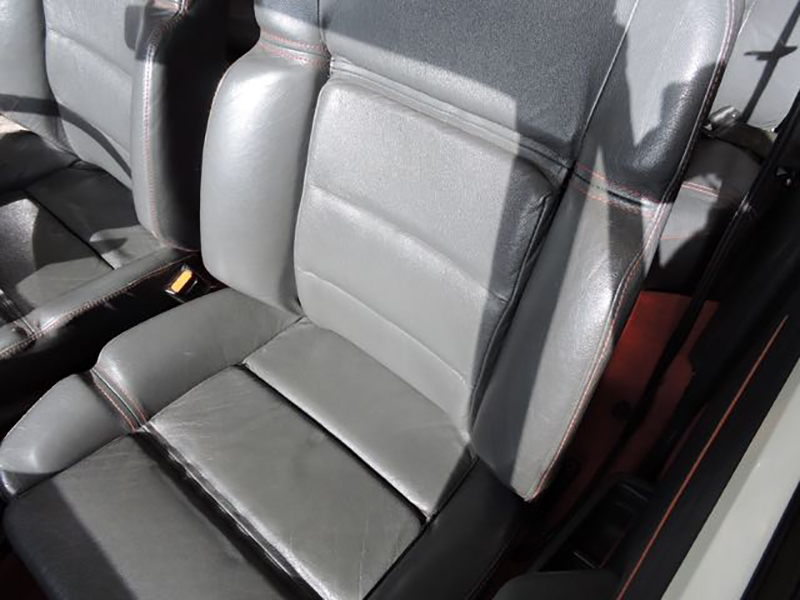 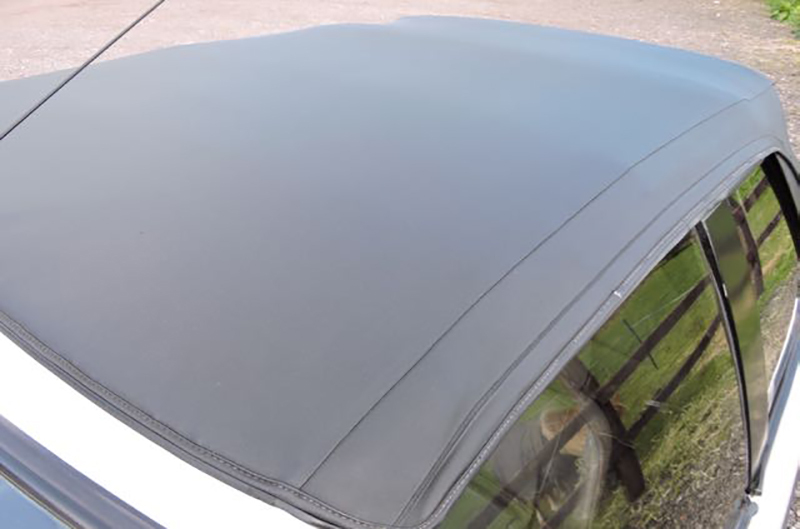 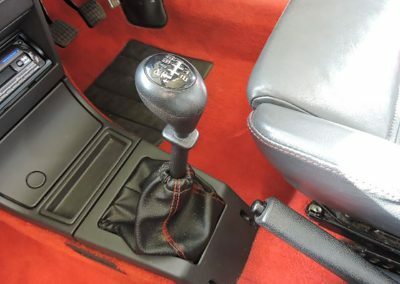 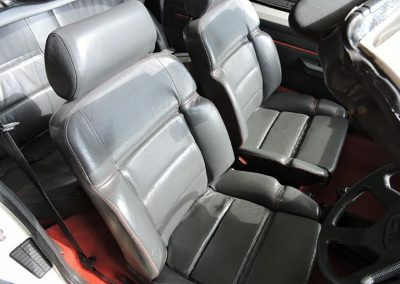 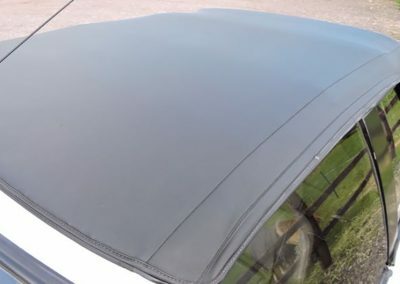 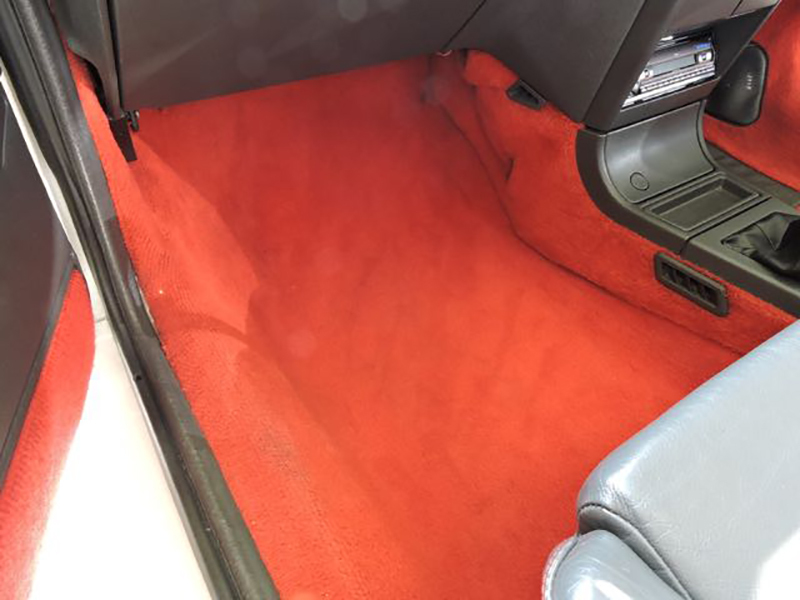 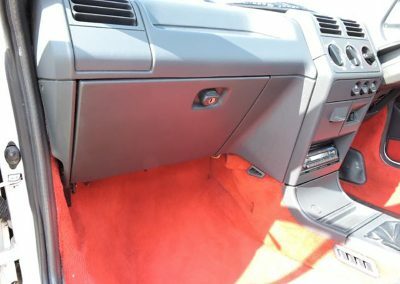 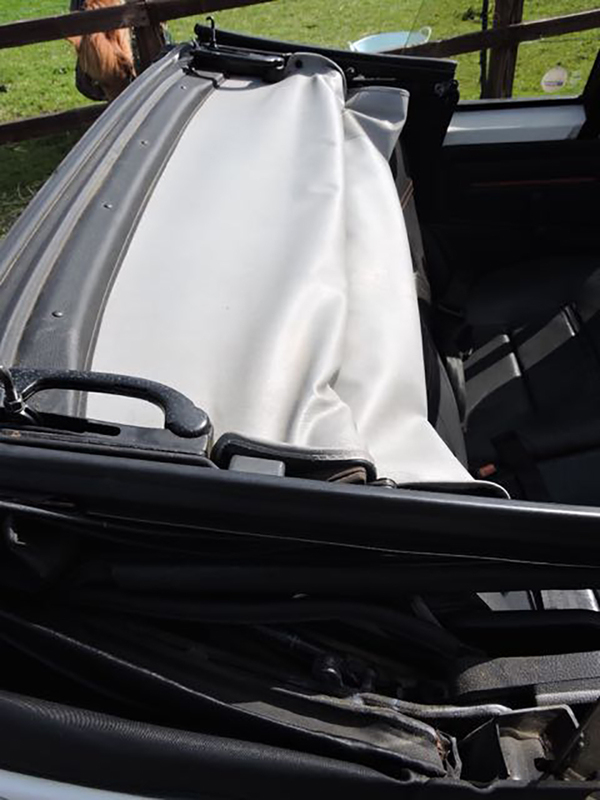 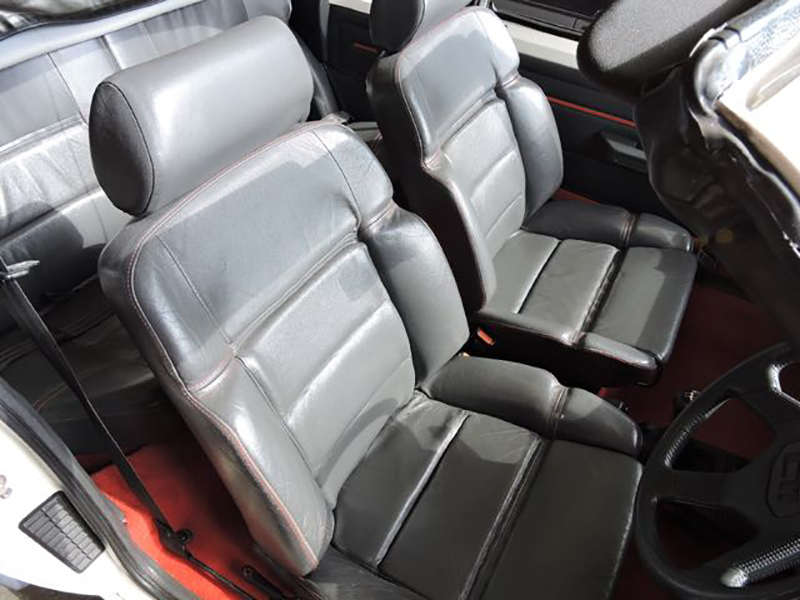 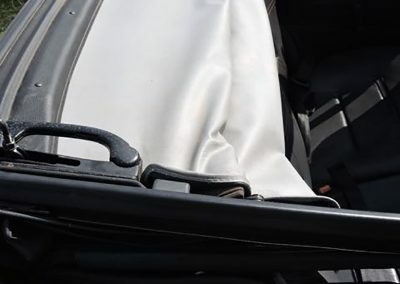 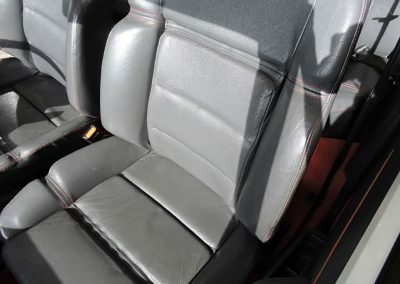 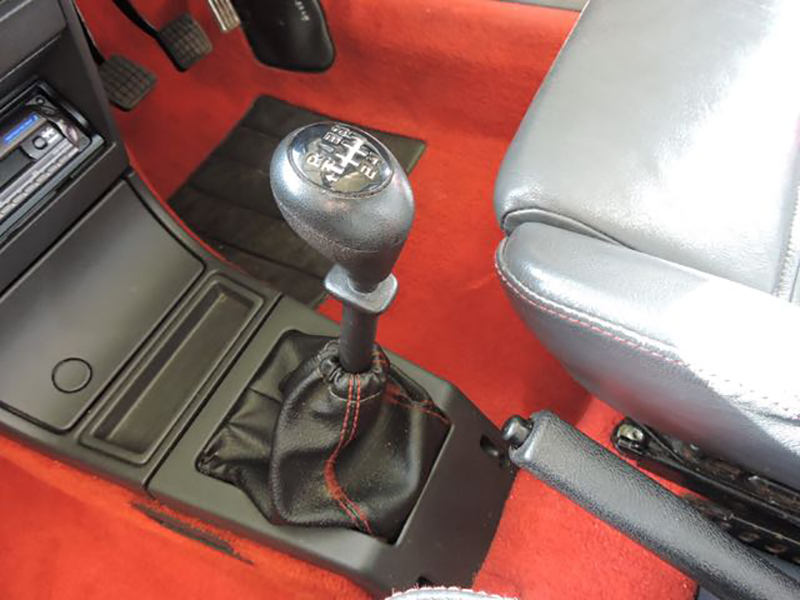 This car is fitted with the optional leather sports seats from the 1.9 GTI and are in very good order with no rips or tears and little in the way of scuffs on the seat bolsters. 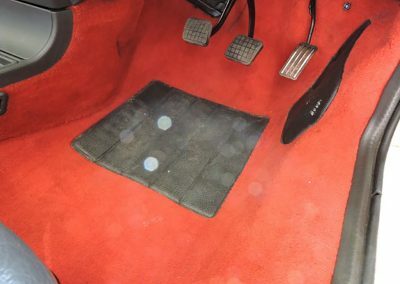 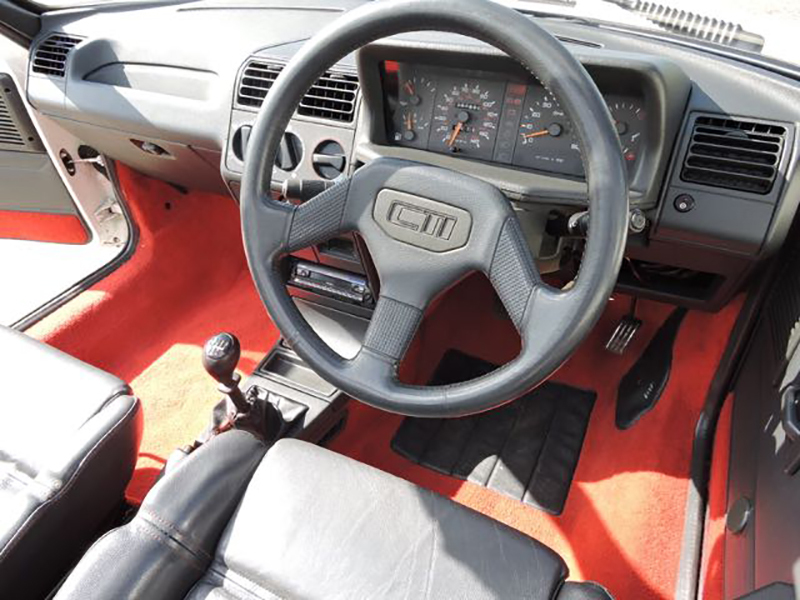 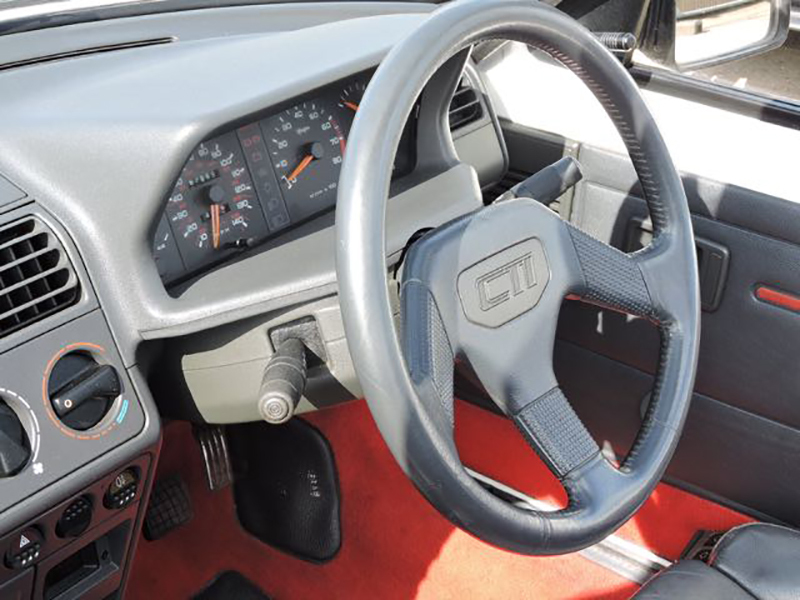 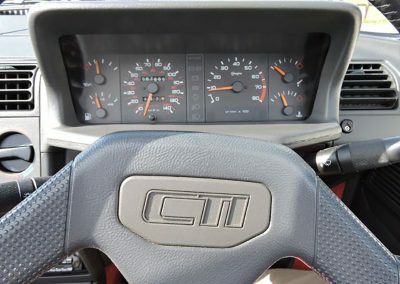 The red carpets and dashboard are again in excellent condition and give the impression the car is a couple of years old rather than the 30 she really is. 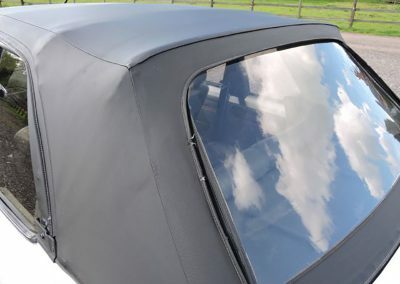 The hood folds down by hand and is easy to operate and the heating and electrics all work as they should. 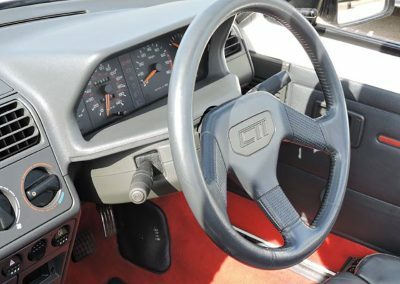 The 205 has the following equipment. 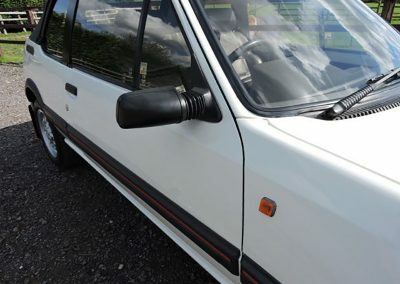 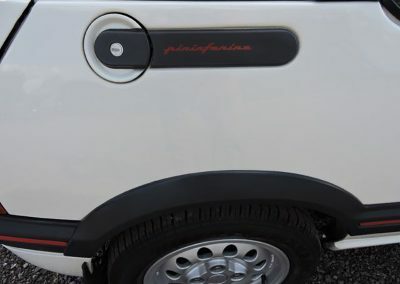 Electric front windows, Alarm, Sony stereo system, 5 speed close ratio gearbox, Sports leather seats, Halogen driving lamps, 14” Pepperpot alloy wheels, Front and Rear seat belts, Split folding rear seats. 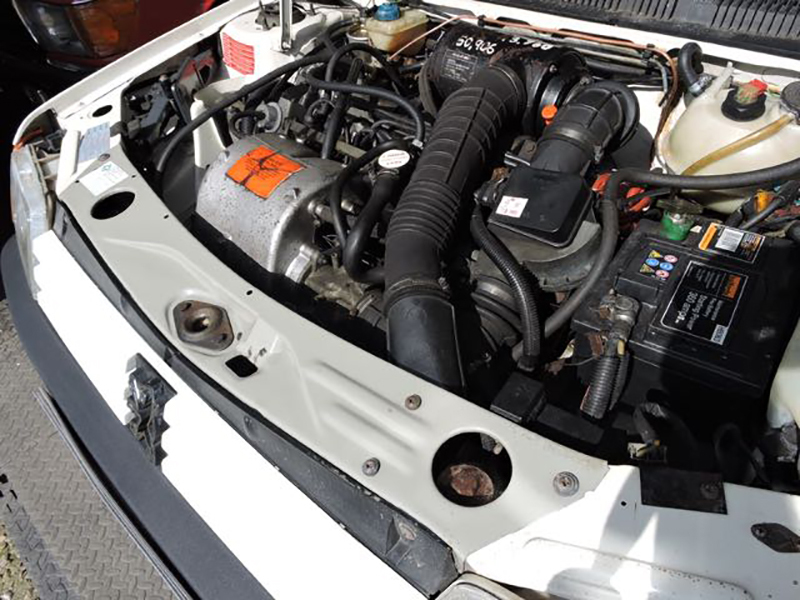 The 1.6 litre engine has Bosch fuel injection and produces 115 BHP. 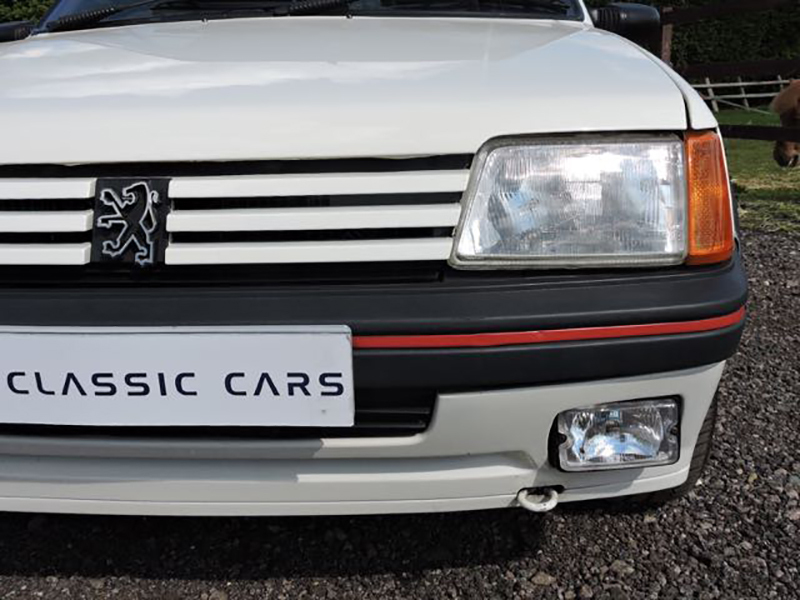 In a car weighing just over 850kg this Peugeot is a little cracker of a car with a top speed of 118 MPH and a 0-60 MPH of just over 9 seconds. 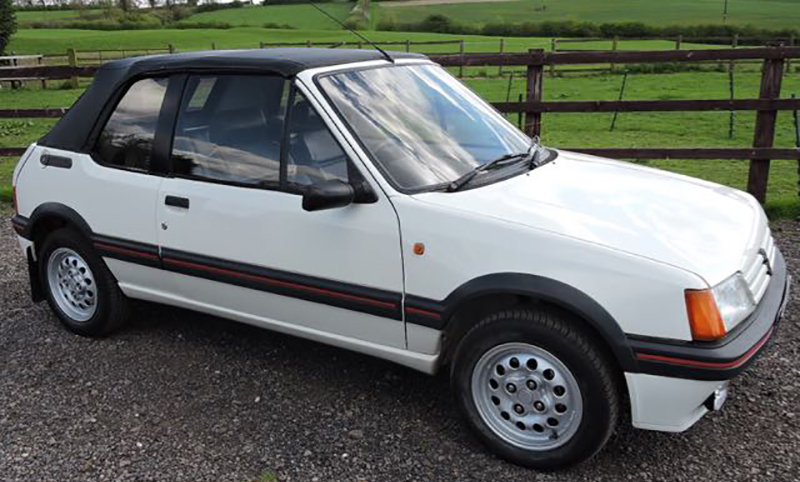 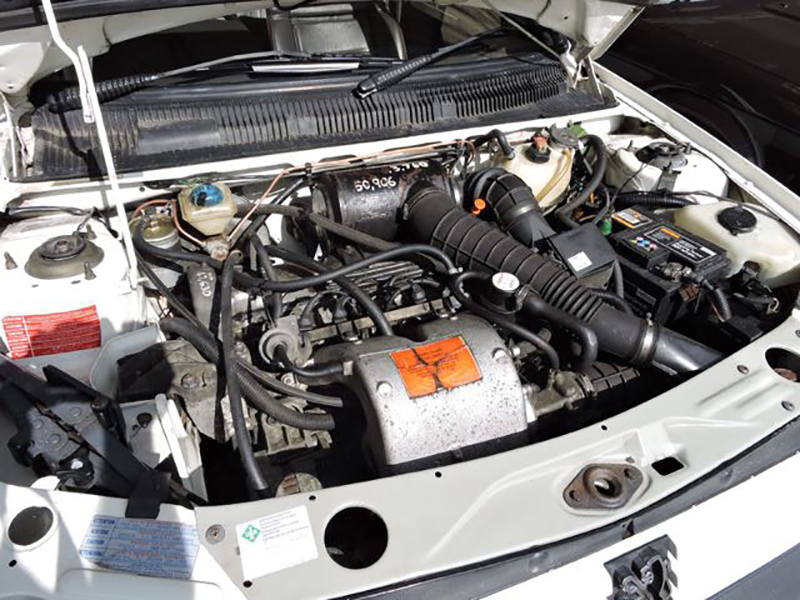 The 5 Speed close ratio gearbox is pleasant to use and with the 205s fantastic handling composure this car is a joy to drive with the roof up or down. 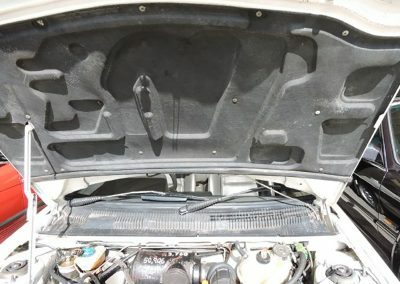 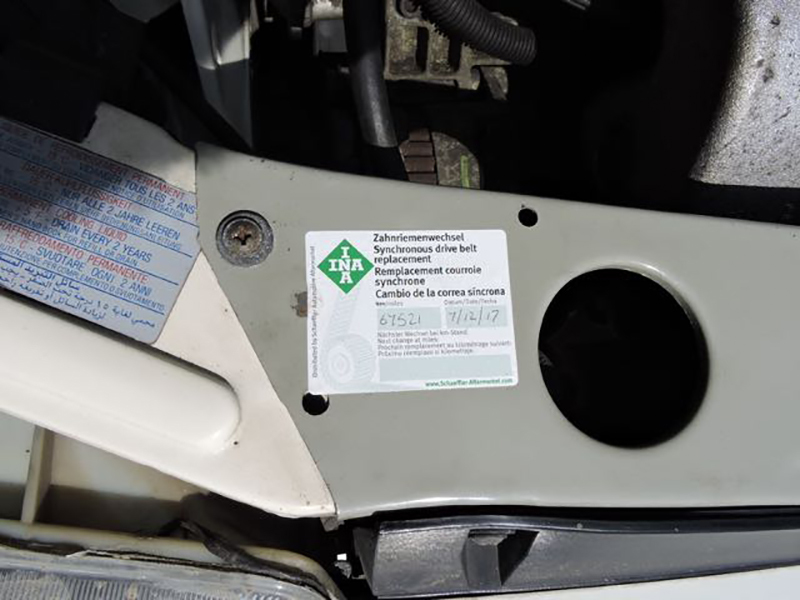 At the advertised price the car will come with a three month mechanical breakdown warranty and a fresh MOT.